We specialise in compressor sales and servicing, whether you need a brand new compressor, an overhaul or simply a filter change. We also provide installation services, repair and preventative maintenance. We are fully qualified engineers recognised with Industria and can help with all aspects of compressors, from purchase and installation, to repair and regular maintenance. The compressor is the lifeblood of any dive centre and we recognise this which is why we make compressors our priority for emergency call-outs. AirEquipo is a one stop shop for compressors, panels and fill stations.AirEquipo is a one stop shop for compressors, panels and fill stations.AirEquipo is a one stop shop for compressors, panels and fill stations.AirEquipo is a one stop shop for compressors, panels and fill stations. We offer a broad range of compressors and our team can advise on a suitable compressor to fit your specific needs, and can also add a Nitrox Membrane if you so require. We guarantee the best after-sales and installation service available on the Canary Islands. We can also assess a second hand compressor on your behalf that you are interested in purchasing and provide you with a non biased opinion on its value and reliability. Following purchase and installation of any compressor and/or filling station, we offer a free introductory course with a completion certificate for up to three participants. 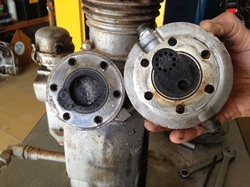 This photo shows a Bauer compressor with only 300 hours operation since its last valve change. It shows the 1st stage and reed valve (top). There is a lot of carbon build up and rust which is a result of a hot and wet environment. The compressor does not receive enough cooling and carbon starts to build up and choke the valves. Carbon build up can cause the valves to stick open and results in a lack of pressure in each stage of the compressor. You may notice that your compressor takes a long time to reach final pressure, or a safety valve may be blowing. Too much moisture in the environment causes the rust to form, especially if the compressor is not used frequently. 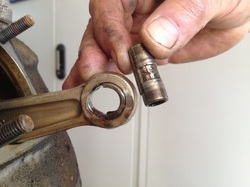 In this photo the top end bearings of the 2nd stage have failed and the piston pin has damaged the connecting rod. With preventative maintenance, we can ensure your compressor is running smoothly and efficiently. When we undertake an overhaul service on a compressor, we open the unit up completely to bare basics to look for signs of wear. We can advise you how to maintain your compressor to achieve maximum service intervals, and we can also undertake to regularly maintain your compressor to keep it in optimum working order with an AirEquipo Service Contract. Please be aware that Spanish law requires that you keep a record of a regular maintenance and service.